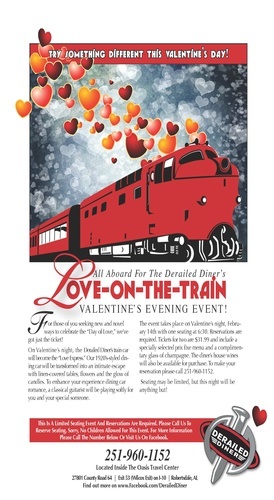 On Valentine’s night, the Derailed Diner’s train car will become the “Love Express.” To make your reservation please call 251-960-1152. Our 1920’s-styled dining car will be transformed into an intimate escape with linen-covered tables, flowers and the glow of candles. To enhance your experience dining car romance, a classical guitarist will be playing softly for you and your special someone. Valentine’s night, February 14th with one seating at 6:30. Tickets for two are $31.99 and include a specially selected prix fixe menu and a complimentary glass of champagne. To make your reservation please call 251-960-1152.